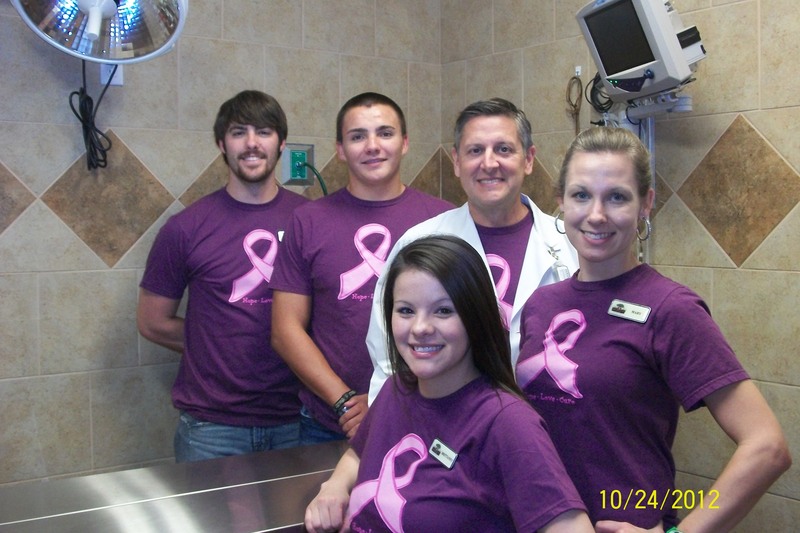 The PAPC Animal Hospital Team promotes pet cancer awareness in their purple and pink t-shirts. Make sure your pet gets twice yearly veterinary wellness exams to help identify early warning signs and risk factors. Keep your pet at a healthy weight. Just like people, pets who are overweight or obese have a higher risk of developing many diseases, including cancer. Spay or Neuter your pet early. Some types of cancer are almost 100% preventable when your pet is spayed or neutered while he or she is young. Good nutrition and regular exercise are key to a healthy immune system. Feed your pet a high-quality diet, and insure both dogs and cats get daily exercise. Reduce your pet’s exposure to noxious chemicals such as lawn fertilizers and pesticides, vehicle exhaust, over-the-counter flea and tick treatments, and cigarette smoke. Limit your pet’s UV exposure by keeping him or her inside during the times of day when the sun is most intense. Talk to your veterinarian about your pet’s vaccination schedule and eliminate unnecessary vaccinations. However, prevention of feline leukemia decreases the risks of cats developing lymphoma. For more information on how to prevent cancer in your pet, contact us at 979.266.7080. 25% of all dogs and 12% of all cats will develop cancer. PAPC Celebrates You and Your Best Friend! 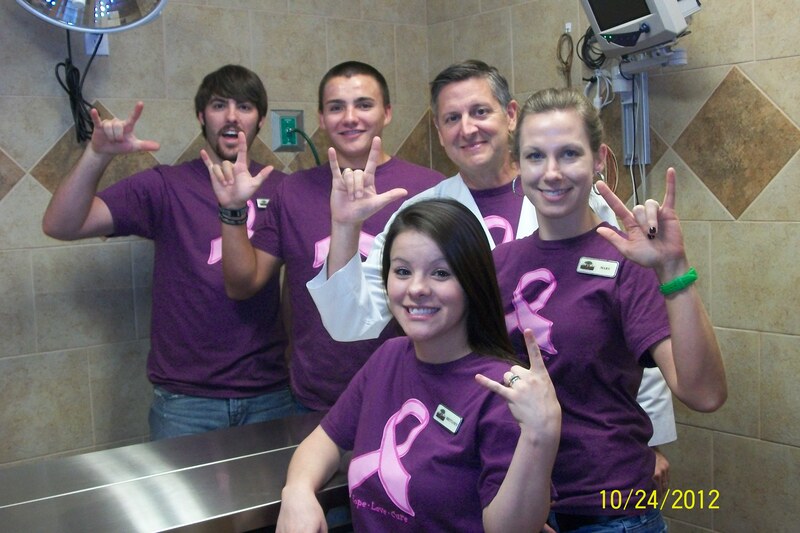 The PAPC Hospital Team is promoting pet cancer awareness this month with their purple and pink t-shirts. Clockwise from left: Orey Fails, Mark Hoffmann, Dr. Suazo, Mary Moritz, Brittaney Pate. It may surprise you to know that cancer is the #1 disease-related killer of pets. Protect your pet with regular veterinary examinations and by being on the lookout for any early warning signs of this disease. If you notice any of these signs in your dog or cat, give us a call today! Early detection is critical in the fight against pet cancer. Pet cancer early warning signs from the American Veterinary Medical Association. Consider pet insurance to help pay for unexpected veterinary expenses. http://www.petinsurance.com. Quasimodo, or Modo for short, came into my life when I needed him most. Jason had just finished his first year at LSU vet school, and I was just about to begin my first year of law school. We had just lost our black pug, Reggie, a few months before, and I swore I would never love another dog again. It just hurts too much to lose one. We lived in Port Allen, Louisiana, in an old plantation store–the two large porches on either side had been converted into apartments with a giant storage area in the center, and the strange little store turned dwelling was situated right in the middle of a working sugar cane farm. LSU was an easy commute accross the Mississippi River, and we enjoyed living among the giant sugar cane stalks. Our home was mostly hidden from sight, accessible by a long, narrow gravel drive; only the rooftop was visible from the lonely street. I was instantly suspicious, “you didn’t get a dog while I was gone, did you?” Feelings of anger brewed–he knew I didn’t want another dog. “Just come see.” He grabbed my hand and pulled me up the steps to the front door, and as I looked in through the large glass door, I saw the saddest little pitiful lump of puppyness sitting in the middle of my living room. The poor little thing tried to get up to come greet us, but his head was so large and his legs were so short, each time he tried to steady himself, he would topple over, head first. His fur was a strange mottled color, his tail was stubby and curved under, and one ear hung down while the other stood straight up. He was the ugliest thing I had ever seen, and I knew at that moment that I was in love. “He’s an ‘Imposs-i-Bull,'” Jason explained. He had found a sign in the elevator at the vet school. 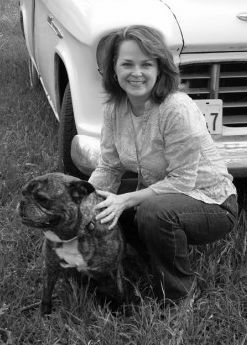 One of the school’s vet techs bred champion French bulldogs and champion bullmastiffs. She had over twenty years of success with each breed. Because of the size difference, she didn’t think that it was physically possible for them to mate. She was wrong. Modo was the offspring of a 23-pound French bulldog mother and a 126-pound bullmastiff father. He was the last puppy she still had, the ugly little runt of a litter of four. Of course Jason would bring him home. It didn’t take long to come up with a name for this strange, freakish puppy. Victor Hugo’s Hunchback of Notre Dame, known for his physical deformities, yet proven to be kind at heart, was named Quasimodo–which in Latin translates to “almost the standard measure.” Modo’s stange appearance frightened many, yet he had a sweet and gentle nature. He was too large and looming for a French bulldog, but not quite big enough to be a bullmastiff. He grew to become a 60-pound dog, but never reached over about two feet tall at the shoulders, short and squat with an enormous chest and head. Jason told me while he was still a puppy, that because of his physical deformities, he probably would not live as long as most other dogs–eight or so years at the most. But everyone who met him, even people who professed to not like dogs, loved this odd creature. As Modo began to grow into his giant head, he was a constant source of amusement for us. Always adapting to his strange body, he learned to walk sideways down stairs, to keep his heavy skull from getting him off-balance and causing him to tumble down head first. He frequently fell face-first into his food and water bowls, then would awkwardly regain his balance to come over and give us a sloppy wet kiss as we laughed at his expense. He loved to bask in the sun in our front yard, not moving for hours, greatly resembling a giant gargoyle lawn ornament. He was the pleasant host at all of our crawfish boils, attended vet school and law school parties, and befriended people and dogs of all breeds and sizes. One year he indulged in too many appetizers before our Christmas party. He would clear the room with his gassy emissions, and we would put him outside in the back yard. He would circle around the house and re-enter with the next group of guests before the next emission would unpleasantly remind us of his presence. Always gentle and patient, Modo was the perfect babysitter when Claudia was born. She learned to crawl by trying to keep up with him, and he would indulge her for hours as she sat on his back and pulled on his ears as reigns. When our parents would come to visit, they would stay with Claudia while Jason and I were at school. Modo would shadow them closely to be sure his baby was safe. When Claudia was about a year old, her Uncle Matt was tossing her in the air. She would squeal in delight and laughter. Modo was not sure this was safe. He gently, but firmly grabbed Matt’s arm in his mouth and guided him to the floor. No horseplay was allowed on Modo’s watch. However, it was a few months later when Modo proved to be my true Guardian Protector. It was December, and I was just finishing with my second year of law school semester exams. Claudia was about 18-months-old, and I was about 8-months pregnant with Isabella. Jason was doing a preceptorship at Audubon Zoo in New Orleans, and he only came home on the weekends. I was home alone with Claudia during the week. It was about midnight, and I was asleep in my bed with Claudia by my side. Modo was asleep on the floor next to my bed. I awoke to a strange, electric feeling in the room, and looked down at Modo. He was crouched, but his posture was erect, ready to spring. His hair was on end, hackles raised, and a deep rumbling growl pressed from his chest. He was staring through the bedroom door at our glass front door. I slowly and quietly shifted positions so that I could see what he could see, and I was instantly gripped in fear. Silhouetted by a full moon behind him, a man was on our front porch, quietly trying to pry our lock open. I was trapped. Pregnant, with my young child asleep at my side, the only phone was in direct view of the door. The old lock surely would not be hard to pry open, and it would only be moments before this man was in my house. Before I had time to think, Modo slowly moved from his crouching position and crept toward the door. When he was about three body lengths from the door, he sprang–leaping at the door and crashing his enormous chest against the frame as monstrous snarls roared from his throat. The man fell backward over the porch railing and scrambled up to run for safety. I grabbed Claudia, and ran to the phone to call for help, as I watched the man through the window running away, disappearing in the sugar cane. Modo returned to my side, continuing to watch and growl, protecting us with his love. Modo stayed with us a lot longer than we expected. His life expectation of eight years stretched into thirteen. The dog I didn’t want became the dog I loved the most, my hero and my Guardian Protector. He was my truest friend when I needed him the most. As he grew older, his days became increasingly painful and confusing for him. Jason and I delayed the decision as long as we could, but it became evident that it was time to release this gargoyle from his awkward and pain-ridden body. Jason gave him morphine for his pain, and he fell into a deep, restful sleep, snoring loudly. True to his spirit, his loud snores made us smile through our tears as we ushered him out of this world and on to the next. I believe he continues to protect me with his love, and he will be waiting for me when it is my time to join him. We Have Updated Our Website! Let us know what you think. 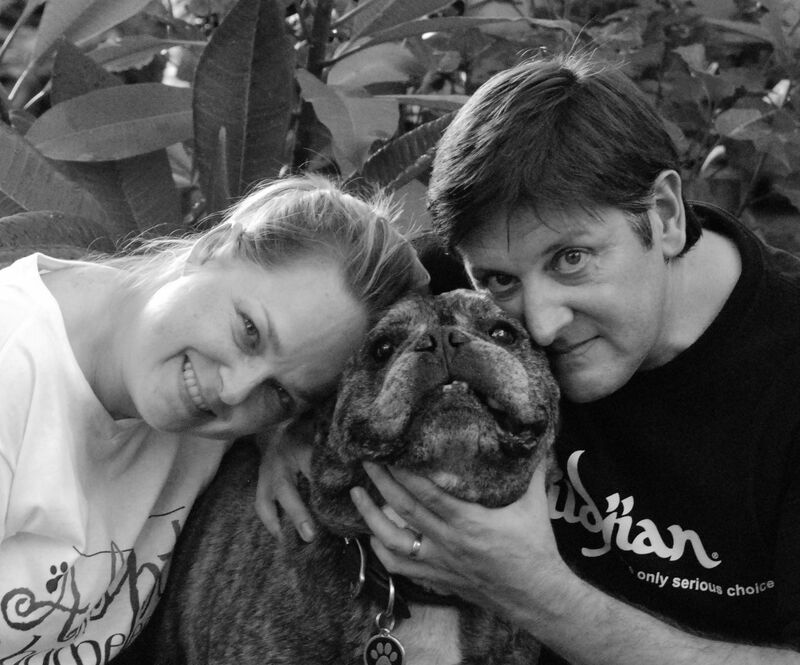 At Pecan Acres Pet Care, we believe that our work is a manifestation of our love–our love for animals, our love for our community, our love for our patients, pet guests, and clients. You and your pets are the reason for our work and we are here to serve you. Please let us know how we’re doing. Our goal is to always exceed your expectations, and if we are successful, we’d love for you to share your experiences with us and the world. If we are not successful, we want to hear about that also–we will use each failure as an opportunity to learn and grow. You may have noticed that we have updated our Website. It is now much more user-friendly, and you can leave your comments here. You can also share our pages with your friends by links at the bottom of each page and each post. We look forward to hearing from you!